Sci-Fi action movies always strive to be epic – to catch the same feeling that you had at the end of your first viewing of Star Wars or 2001 – and Oblivion is no exception to reaching for that feeling. Though it doesn’t reach the exact level of these movies, this new feature comes close by borrowing from many of the sci-fi movies we love but assembling them in a fresh way. Oblivion is a great film with wonderful effects, expansive scenery, a moving soundtrack, and a performance that reminded why we love Tom Cruise. In the world of Oblivion, Jack (Tom Cruise) and Vica (Andrea Riseborough) are Tech Team 42. They are a two of the last humans on earth in the year 2077, tasked with the protection of generators turning earth’s seawater into energy for the colony established on the moon Titan. They have no memories of their lives before this assignment, and they spend their days tending to the drones that hunt an alien species, the Scavs, who work to sabotage the energy generation project. 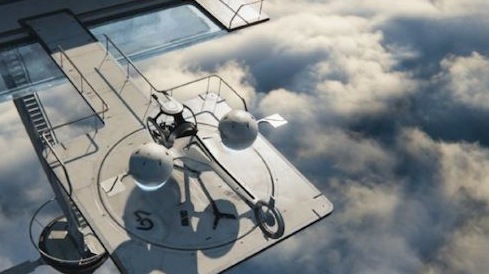 They also get to live in one of the coolest apartments imagined, nestled above the clouds (love scene in a see through pool, ftw!). Though Jack’s memory has been wiped, he constantly recalls images and snippets of a story that took place in 2017 – memories that shouldn’t be his. Because of these memories and because Jack is not completely convinced of leaving earth to rejoin the rest of humanity, he does not always follows the rules. He collects earth items even though they are reported to be radioactive, he sets up a getaway near a lake and retreats there from time to time without Vica, who is much more concerned with the rules. When a drone goes missing and Jack finds a signal being broadcasted to outer space through the top of the Empire State Building, he stops challenging the rules and starts breaking them to investigate areas of earth that are off limits. In the process, he finds a crashed space shuttle with no explanation of its existence, and the Scavs are not what they seem. 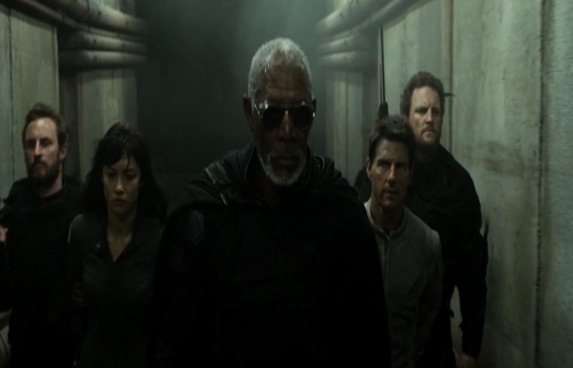 They are actually humans fighting to save the earth with Beech (Morgan Freeman) as their leader, there is no human colony on Titan, and he is a clone of an astronaut that was one the crewmembers of the downed shuttle. Having saved one of the astronauts from the shuttle, Jack is able to reclaim the memories of the man whose DNA brought him into existence. Not only did he know Julia (Olga Kurylenko, the woman he saved from the shuttle, he was married to her. Together, they all work to uncover the truth and a way to destroy alien ship that is sucking earth dry. The pacing of the movie is amazing. The story unfolds as a sci-fi mystery only letting you know the full story halfway through the movie. This lends itself to the action sequences, which are dizzying in IMAX and choreographed well to keep up the apprehension. However, in the quieter moments of the movie, you are not urging it to go on. And as mentioned before, Oblivion borrows from many other films in the genre (I stopped counting at 16), but it’s not offensive at all. It still feels like a new story with enjoyable characters that you want to see survive and win. Another plus is the scope of the scenery. It is expansive, and the camera glides through a landscape of familiar NYC landmarks, off to far reaches up the Hudson River, and then outside of earth’s atmosphere. To tie it all together, the movie features a soundtrack by Anthony Gonzalez of M83 and Joseph Trapanese. At moments, it is almost nostalgic, working you like an 80s power ballad with intense synth music, but it also has symphonic depth and perfect cues to the emotion and pace of the scene. I have not enjoyed a Tom Cruise film so much in a while. 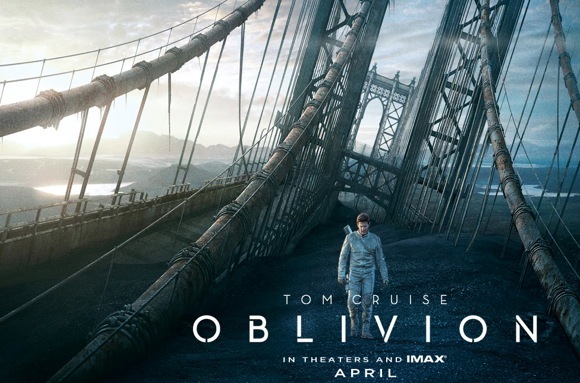 Perhaps the issues of his personal life have overshadowed things for a while, but Oblivion rises above those issues to deliver a well-constructed story and production that delivers a thrilling final product. This entry was posted on Friday, April 19th, 2013 at 7:23 pm	and is filed under Film, News. You can follow any responses to this entry through the RSS 2.0 feed. You can skip to the end and leave a response. Pinging is currently not allowed.